A roadtrip isn’t about the distance covered; it’s about the state of mind. Doesn’t matter if it’s around the world or around the block, the roadtrip is about putting yourself out there, with open eyes and a sense that you’re about to discover something. And there’s always something to discover. Like yesterday. Was one of those rare lazy Saturdays where I had nothing on the calendar. Got up early and decided to make some zucchini bread to clear out some room in the fridge (don’t laugh – if you have zucchini in your garden, you know not to laugh). Did it the old-fashioned way, setting out all the bowls, grating everything by hand, taking my time in a quiet morning meditation. But by about 11 o’clock, I was done with the at-home thing. D & J had headed off to Great America, and M, in full teenager-in-summer form, hadn’t yet stirred. The zuch bread (what of it I’d not already eaten) was baked, cooled and wrapped, and leftover bacon – cooked to lure M from her slumbers – was set aside on the counter. I wasn’t needed here, and I was getting fidgety. Set out on my bike with no destination. Nominally the Palo Alto farmers market, but that was only an excuse. I just needed to go. To go and lose myself in a swirl of differentness. To go just to go. Natembea. I did find myself at the farmers market, though. The familiar, comforting chaos of beets, chard, white peaches, and apricot. And apricots and apricots. The fresh baked bread wafting, kids and fallen berries underfoot. There’s something inherently comforting to me about wandering these places – for reasons I can’t begin to explain, I draw strength and focus from them. I was just about done and heading back to the tree where I’d left my bike when I noticed a small sign propped up by the tables where some families were dividing the market-bought treats among their kids: “Farmers Market seating courtesy of The Chocolate Garage”. Well, that was pause for thought (okay, anything with the word “chocolate” in it gives me pause for thought). 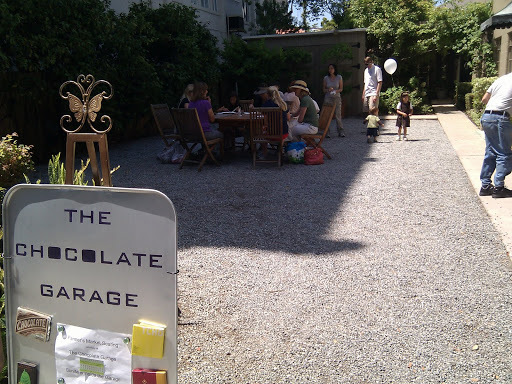 I wasn’t sure what a “chocolate garage” would look like, or even how to parse the phrase, but down the gravel lane, past another table or two, was a something that looked like a small 1940’s era garage nestled in the shadow of an ivy-covered apartment building. Somewhere in the back of my mind, my roadtrip sense tingled. Honestly, it didn’t take that much courage to wander down to the end of the land and peer my head in, but I wasn’t prepared for what I saw when I looked. It was indeed a garage, but with a brightly-painted interior covered with wrappers from hundreds of exotic chocolates from around the world. A low, broad table was set in the middle, tiled with trays and plates, each stacked with broken squares of a dozen different shades of brown and black delights, around which half a dozen people of all ages were seated on chairs and cushions, chatting happily as though in the middle of a private tea party. A woman in pink slippers was just bringing another tray to the table. As I sat on the floor and sampled, comparing notes with the old hipsters, young mothers and twenty-somethings, Sunita explained the situation. She’d had the garage for about a year. She liked to concentrate on small, bean-to-bar producers who ran the entire process themselves, so she could know that she really was supporting fair trade (not TM) production. She ran private tastings on the side, but on Saturdays opened the garage to market goers – just to stop by and try a taste or two. 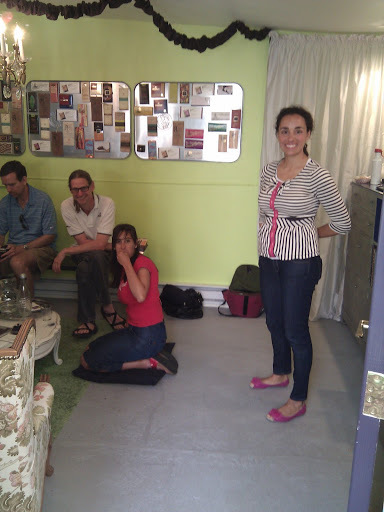 Old friends came in and embraced Sunita, then plonked themselves down on an empty cushion around the table. More chocolate was already coming out (“Oh – I’ve got one you’re going to love!”). I felt I would have been welcome there for the whole afternoon, but was feeling guilty for having left Miranda on her own, slumbering at home. 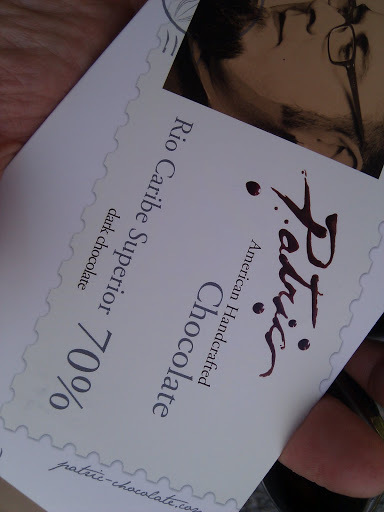 I thanked Sunita as best I could, asked if I could purchase one of the Patric 70% bars (nicely conched and smooth; a purist’s bar, with only cacao, cane sugar and cocoa butter), and promised I’d be back. Then made my way back to my bike, another wonderful little roadtrip in the bag.